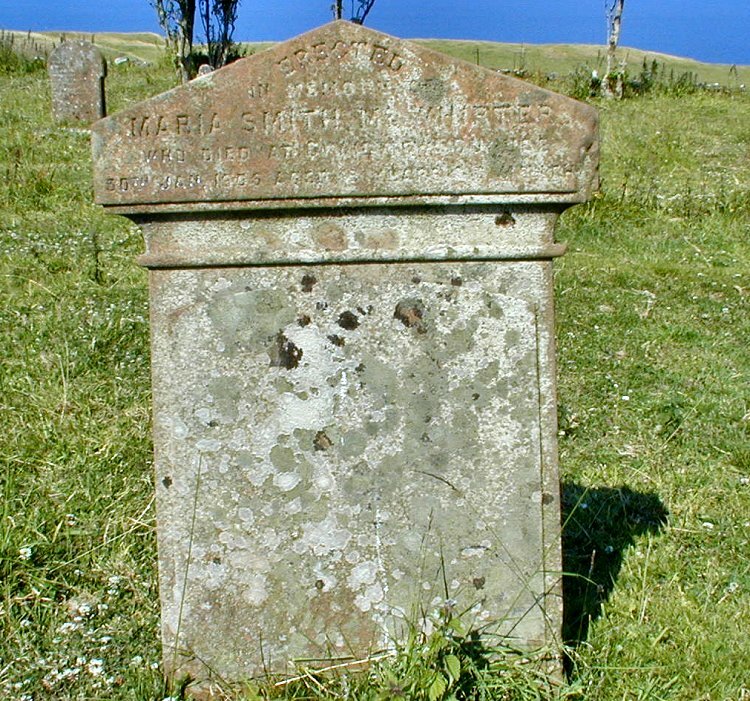 Erected in memory of MARIA SMITH McWHIRTER who died at Craigview Dunure 30th January 1906 aged 13 years 3 months. 1. James McWHIRTER was a Shepherd. +2 i. Andrew McWHIRTER (born about 1834). 2. Andrew McWHIRTER (James-1) was born about 1834 in Parish of Barr, Ayrshire. He was a Shepherd. 5 i. Mary WcWHIRTER was born on February 19, 1862 in Parish of Straiton, Ayrshire. +6 ii. Adam McWHIRTER (born on November 11, 1863). 7 iii. Andrew McWHIRTER was born on December 25, 1866 in Parish of Dalmellington, Ayrshire. 6. Adam McWHIRTER (Andrew-2, James-1) was born on November 11, 1863 in Parish of New Cumnock, Ayrshire. He died on January 16, 1946 in Pladda View, Dunure. He was a Master Joiner. He was buried in Dunure Cemetery. 8 i. Annie McWHIRTER was born about 1884. She died on May 5, 1916 in Craigview, Dunure. She was buried in Dunure Cemetery. 9 ii. Maria Smith McWHIRTER was born about 1893. She died on January 30, 1906 in Craig View, Dunure, Ayrshire. 5 She was buried in Kirkbride Churchyard #30. 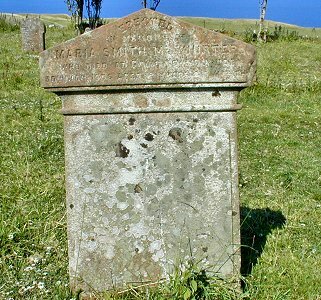 Monumental Inscription at Kirkbride Churchyard - Erected in memory of MARIA SMITH McWHIRTER who died at Craigview Dunure 30th January 1906 aged 13 years 3 months. 10 iii. Mary McWHIRTER was born about 1903. She died on February 25, 1960. She was buried in Dunure Cemetery. 1. Old Parish Registers of Barr. 2. Old Parish Registers of Barr. 3. Marriage Certificate #2 of 1859 at Middlebie, Dumfriesshire. 4. Marriage Certificate #27 of 1884 at Maybole, Ayrshire. 5. Death Certificate #9 of 1906 at Maybole, Ayrshire.